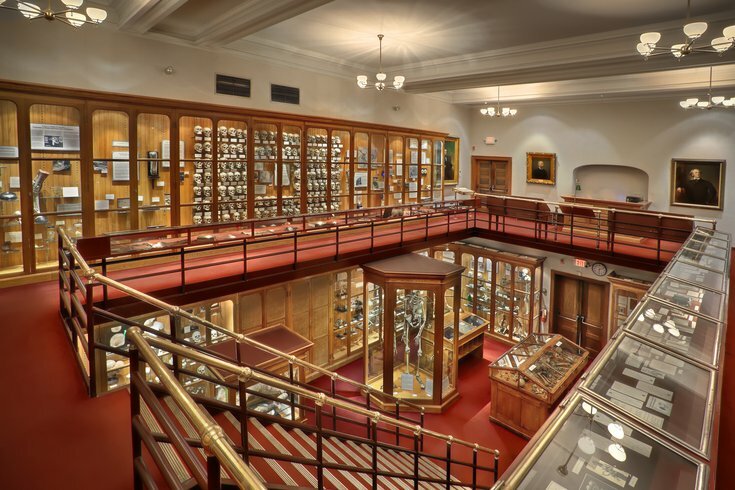 The main gallery of The Mütter Museum of The College of Physicians of Philadelphia. The Mütter Museum, the National Constitution Center, and the Fabric Workshop and Museum are among 45 local art and cultural organizations splitting $8.7 million in grants given by the Pew Center for Arts and Heritage this week. Twelve individual fellowships and 33 project grants were awarded to Philadelphia-based artists and programs. Individual fellowships are awarded with $75,000 to artists who have shown artistic brightness in music, visual art, film, poetry, dance and theater. Project grants are awarded up to $300,000 with an additional 20 percent for general operating costs to Philadelphia cultural programs and experiences for organizations that cater to a wide audience. Some of the notable recipients included University of Pennsylvania Libraries who will present "Walt Whitman’s 200th Birthday Celebration." It will feature several performances and installations on the impact of his work, including a reading of Whitman’s poetry by singer and poet Patti Smith. • The Mütter Museum will build an interactive exhibition for the influenza pandemic that ravaged Philadelphia from 1918-1919 called "Spit Spreads Death." • The National Constitution Center is putting together a theatrical experience on the reconstruction era in the U.S. and the passage of the 14th amendment with the help of Tony Award-winning sound designer and composer Rob Kaplowitz, and three-time Obie Award winner Ain Gordon. • Fairmount Park Conservancy will partner with Trish Brown Dance Company to bring free public performances of Brown’s influential choreography to the city. Individual Philadelphia fellowship recipients included Ken Lu, an artist known for his interest in individual and societal identities and diversity through several artistic mediums, and Ursula Rucker, an interdisciplinary poet and performer who released five albums with several artists, including The Roots. She has also toured and performed her memoir, My Father’s Daughter, live. Other winners of note include the Fabric Workshop and Museum, South Asian American Digital Archive, and Stenton House’s new memorial, "Inequality to Bronze," to Dinah, an enslaved woman who resided at Stenton and is credit to saving the house from being burned by the British in 1777. For the full list of this year’s winners visit the Pew site here.